Want comprehensive control over your business and/or your residence? Access to your security system, all lighting loads, thermostats, door locks, window coverings, surveillance cameras, audio/video and more? From anywhere in the world? Leviton offers a wide variety of comfortable control methods without any monthly fees or contracts, letting you manage your property whether you’re lounging on the couch or thousands of miles away on the beach. 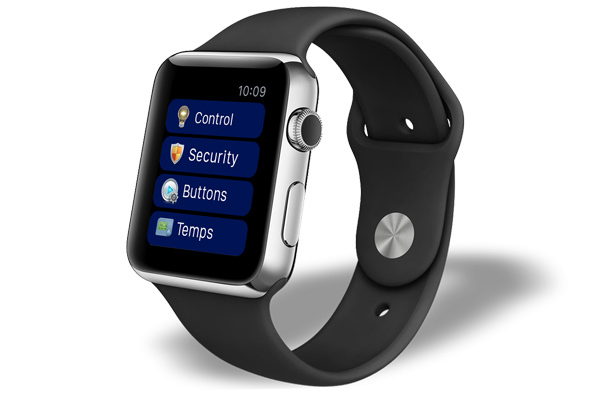 Use our new Apple Watch extension to dim a light or raise the temperature from your smart wristwatch. Utilize the latest Microsoft platform, Windows 10, from a desktop, laptop, or mobile device. Of course, iPads and Android tablets can float around the property and are familiar to the entire family, while smartphones live in our pockets and purses with full ability to view cameras or control a light. All of these Leviton interfaces utilize common graphical elements, ensuring that the experience is similar across every platform and that it’s easy to make adjustments for old and young alike. Snap-Link Mobile for iOS, providing an extension to the Apple Watch. Desire an interface that’s not going to walk away, get lost in the couch cushions, or lose battery power? Leviton’s OmniTouch 7 touchscreen is a dedicated, “always there, always on” solution that’s ideal not just for boardroom tables but also in-wall in the foyer of a residence. This not only adds a constant interface that you can count on, but can add enhanced features like intercom communication to front gates or entrances. Additionally, when using BitWise, an integrator can customize the entire touchscreen interface to match your company colors or favorite hobby. Learn more now: Contact Leviton to locate a Five Star Dealer in your area that can consult, spec, install, and program a complete custom system for you. Home Automation saves the day!